Now active compressor nebulizer system users can get more out of their therapy and out of life with the Traveler Portable Compressor Nebulizer System. The Traveler is the perfect travel companion that makes it easier and more convenient than ever to nebulize when users are away from home. And the Traveler is the perfect system to improve your profitability. Not to mention the potential increase in medication revenues that will result from increased compliance with their nebulizer regimen. Both configurations of the Traveler come complete with: Traveler compressor unit, DeVilbiss 800 series reusable nebulizer, West Med VixOne™ disposable nebulizer, five extra filters, extra filter door, tubing adapter, adult and pediatric masks, AC adapter, DC car adapter, carrying case, instruction guide and instructional DVD. Model 6910P-DR comes standard with the rechargeable battery. 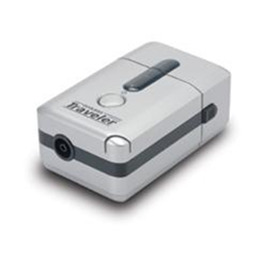 The Traveler is one of the smallest compressor nebulizers on the market. It weighs less than a pound and is smaller than a standard size postcard. The optional Traveler battery is small, easy to attach and weighs .7 pounds. A one-year warranty and 45 minute life makes it perfect for those on the go!